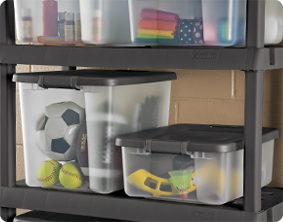 The 25 Quart ShelfTotes are ideal for bringing order to garages, basements and attics. Designed to fit on shelving, and specifically the 5-shelf ventilated shelving unit, to maximize the vertical space around the home. 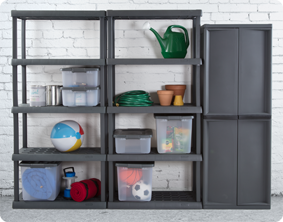 ShelfTotes are stackable, include integrated handles for comfortable carrying, and feature durable latches to ensure that contents remain in place. 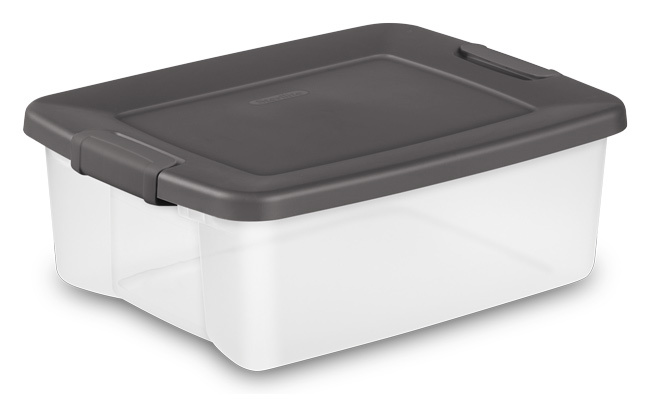 The 25 Qt and 50 Quart ShelfTotes use the same lid, allowing both the shallow and deep sizes to be stacked in same footprint. The 25 Quart version, when stacked 2 units high, equals the height of a single 50 Quart Shelf Totes creating a neat appearance. The overall assembled dimensions for this item are 19 7/8" x 15 1/2" x 7 3/4". 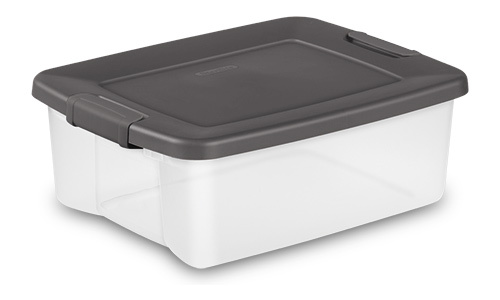 Overall Assembled Size: 19 7/8" x 15 1/2" x 7 3/4"
From painting supplies to gardening and camping items, keep everything contained in ShelfTotes. ShelfTotes are designed to fit neatly on the durable 5 Shelf Shelving Unit. Keep all of your sporting equipment neat, contained and easy to find in ShelfTotes! 25 Quart ShelfTotes is rated 4.7 out of 5 by 6. 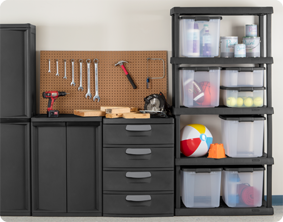 Rated 3 out of 5 by Pasayten from Love this size storage container I have purchased 18 of these containers to sort and store tools, electrical, plumbing, and auto parts in my garage. They are the perfect size and a good quality bin. I have had the tab on two of the latch handles break making the latch fall off hence I downgraded a 5 star review to 3 stars. I have contacted Sterilite and hopefully they will send me some new latch handles. Rated 5 out of 5 by Msbelisario from Great for Homeschooling I needed containers for my children's homeschooling books and activity sheets. I wanted to find containers that is easy for me to organize things. This is why I love the Sterilite shelftotes because it's durable, it makes organizing easier for me, and when I need something from a certain curriculum I can just grab it. I like to stack them so it doesn't take a of space also. Such a great help to me and my children! Rated 5 out of 5 by valamac from Stays sealed I have several these that I use to store items in. They stack nicely in my closet. They also stay sealed. Rated 5 out of 5 by DBG from Perfect for household closets Sizing is ideal not only with Sterilite shelves but also Elfa, ClosetMaid, and many other common brands. Clear plastic makes it easy to tell which bin is holding which item(s) you need. Rated 5 out of 5 by Roz from Was better before I love the fact that these totes fit on my shelves. I bought the shelves and the few clear totes I have together. Yes, these totes used to be clear. Yes, they were a little less durable than some of the blue totes I have in other styles from Sterilite, but for use in the shop for long term storage, clear was the best. Bring back the clear, and I will buy more!